First, express gratitude to your adoptive parents. Let them know that you intend on reunifying with your birth family. They should be in a good place emotionally after many years. They should encourage you to pursue your dreams and root for you. But be prepared for the opposite as well. Your adoptive parents may have conflicting feelings because they feel like they are leaving their little girl or little boy. They may be jealous. They may be happy for you. Whatever the case, thank your adoptive family for taking you in and raising you as their own flesh and blood. Thank them for their sacrifice. Secondly, express your gratitude to your birth family. Thank them first for giving you the gift of life! Your birth mom could have easily chosen to end your life before you were born but didn’t! They could have thrown you in a trash dumpster as an infant but didn’t! That is something to be thankful for. Thank them for placing you in a loving, stable family. Whether it was an international adoption or domestic; whether it was a private adoption or a foster care adoption, your birth parents either facilitated the adoptive placement or they got out of the way and let someone else do what they could not. Either way, it was a loving thing to do. Finally, thank your birth family for meeting with you. They could have easily turned down the meeting and went on with their lives. 2. Be quick to listen. You may have lots of questions and may want to jump right in. This is an incredible moment. Take advantage of it. You may learn more by listening than by talking. Look intently into the eyes of your birth mom or dad. Make up for the lost time. like when babies stare at their caregiver’s face to create an imprint on their minds. 3. Leave your anger at the door. Perhaps you were abandoned. Perhaps your birth parents never attempted to contact you. Perhaps your adoption file was sealed, and you were never able to access it even when you reached years of age. Perhaps you were abused or neglected by your birth parents, and you never told them the trauma it has caused you. A reunification is your opportunity to express your feelings. However, proceed with caution. There will be plenty of time to express your anger and frustration. The initial reunification meeting should not be one of them. The reunification meeting is simply a time to be in the presence of the one who gave birth to you. Be in the moment. An adoption reunification meeting is awesome but leave room for anything to happen. They may be a no-show. They may show up but not give much information. Emotions may run high and your birth parents may be angry at you, for whatever reason. They may think you have an ulterior motive for wanting to be reunified. They may be defensive. Or they may have a spouse or significant other or other children that may be jealous. Be forgiving. Leave room for grace and understand the enormity of the situation from their point of view. You are a person who wants to be a part of their lives after 15, 20, or 25 years. You don’t know what to expect. Neither do they. You have a right to information, but please balance that with their right to privacy. Take it slow. Trust is earned. It is probably best to keep the meeting short and set another meeting in the not too distant future. What were the circumstances surrounding my birth? What was going on the months before I was born? What was family life like? Was your pregnancy a crisis pregnancy, or were you prepared for a child? Who is my father (if your father is not involved)? This may be a difficult one to start out with but probably one that you are thinking about the most. If you are unifying with your mother, be gentle. The harsh reality may be that your mom doesn’t know who your birth father is. Or that the sexual relationship was not consensual. Or that your birth father abandoned your birth mom. Whatever the reason, it’s okay to have gaps in your mom’s answers. You can come back to it some time in the future. Remember, you may think this is your story. It’s really hers. Why did you place me for adoption? How did you come to the decision to place me for adoption? Was it a family decision? Did you ever regret your decision? Did you help to choose my adoptive parents? Why did you choose open (or closed) adoption? The decision to adopt is not an easy one, but a brave one. The story behind your adoption may be a fascinating one, or not. Regardless, adoption is the story of ordinary people choosing to do extraordinary things. Even if you never choose to adopt in your life, your birth parents’ and adoptive parents’ decision to adopt impacted three lives: yours, your birth parents and your adoptive parents. Three sets of lives were changed. That’s called the “adoption triad.” It’s a great thing! Tell me about my grandparents. Are my grandparents still alive? What are their full names? What were they like? Do you have any pictures? Did they know about your pregnancy? Did they support your adoption decision? Your birth parents’ relationship with your grandparents may have been strained. Perhaps they pushed for abortion. Perhaps they wanted to raise you but did not get the chance. If they are still alive, they may provide some details about your family that your birth parents cannot. Do you have any pictures of my ancestors/extended family? Who do I look like in our family? The one thing that adopted children struggle with is that they do not look like their adoptive family. 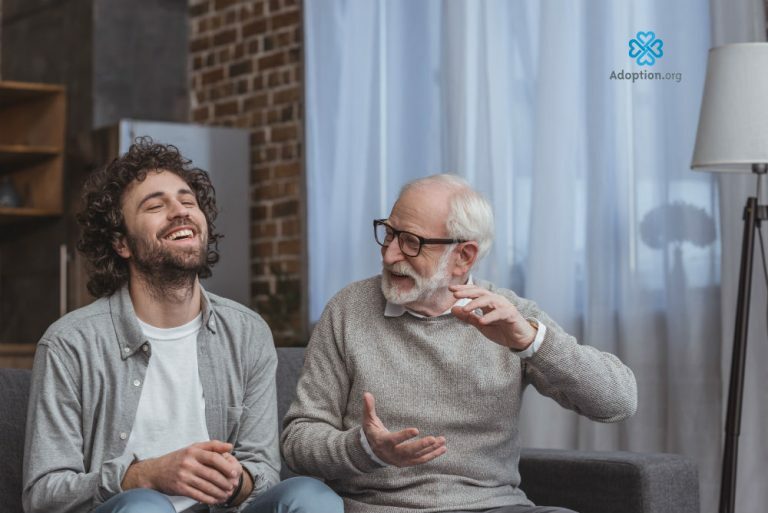 While grandparents may fawn over the similarities between adoptive parents and their biological children, the same cannot be said of the adoptive children. When is the last time someone told an adoptive child how much they look like their parents? Then, when it’s explained that the child is adopted, there is an awkward silence… and an apology. Sometimes adoptees handle it with grace, sometimes not. So, do not underestimate the power of the visual. The first time an adult adoptee meets a blood relative a search for visual similarities is common. “Do we have the same eyes?” or “Do we have the same nose?” or “Do we have the same smile?” are all common questions. Once time goes on, the evidence will become clear. You belong to your birth family, people will comment on how much you look like “Uncle Joe” or “Cousin Janie.” You will feel that you belong and that the missing piece of the puzzle has finally been found. A new photo album would now be appropriate. One that contains your newfound birth family. Did you ever consider abortion? Why did you choose life? Was there anyone who counseled you to get an abortion? This is a tricky topic, given its personal nature. Perhaps it’s a topic that can be broached down the road. If you have the bravery to ask, be delicate. Your mom may have aborted some of your siblings, and she could be feeling tremendous guilt about it. However, it would be good to know how she came to the decision not to abort. Do I have any siblings I don’t know about? Can I meet them one day? Were there other siblings for adoption? If so, why were we not placed together? Meeting long-lost siblings can be exhilarating! Finding someone else with whom you have something in common is a great feeling! It’s like finding a hidden treasure! Asking about siblings is vital in filling in the missing pieces of the puzzle. But meeting and interacting with siblings is even better. Again, the experience may run the gamut of possibilities. On the one hand, you may have a great relationship with your new siblings, become great friends, learn the special ways in which you are connected, and fill in the gaps of the missing time. On the other hand, you may have siblings that are jealous. They may feel that you are not the favorite, and they may wonder how their relationship will change with their parents, now that you have entered the picture. Finally, there may be siblings that you may never have the chance to meet, either through death or simply because you lose touch. Perhaps there are siblings that were adopted by another family. Perhaps there are siblings out there that do not want to meet. Change is hard for some people and adding another relative can sometimes be overwhelming. What is our family’s medical history? Do we have a family history of diabetes? Do we have a family history of cancer? Was there alcoholism in our family? What about mental illness such as depression, bipolar disorder, or schizophrenia? Did you struggle with mental illness, and, if so, at what age did it present itself? Does our family have a propensity towards obesity? Is there a history of allergies in our family? One of the advantages of open adoption is access to medical history. Every adult adoptee has the right to know what possible ailments run in the family whether they were in an open or closed adoption. This way the adoptee can be better prepared when symptoms present themselves. What is my racial/ethnic/national heritage? What country did my ancestors come from? When did our ancestors first come to this country? What language did our ancestors speak? Do we have a family crest? Family trees are a tricky subject with adopted kids. Though a rare discipline, nowadays, adopted children are faced with the fact that the adoptive family tree is really not theirs. On the other hand, the birth family tree may be incomplete. An adoption reunification finally affords the adoptee a chance to fill in the blanks. Transracial adoptions have been the trend in adoption over the last few decades. Placing a child of one race into a family of another race presents challenges and joys. On the one hand, it is great that a family can sacrifice their own needs and wants to adopt a child of another race. On the other hand, as much as that family tries to keep that child connected to their culture, there will always be some gaps. Issues such as hairstyle, food, heritage, history, and culture will inevitably be lost. An adoption reunification can start to make up for what was lost. Adoption reunification has its pros and cons. Some adoptees choose never to reconnect, and that’s fine also. The phrase, “I already know who my family is,” is not an uncommon phrase. But if you do choose to be reunited after you’ve found them then be prepared, not only with the appropriate questions but also emotionally. It will be life changing!